Debut album from Niagara (Turin, Italy). Released 12/2/2013. All physical product orders will also receive an emailed digital download link. - The Italian word for the number 8, which rotated 90 degrees becomes the ancient symbol of infinity. - The first Niagara L.P.
- The magic number in nuclear physics. - The number of the "Law of Ocataves" from Georges Ivanovich Gurdjieff. - The number of the lotus petals, and therefore, in Buddhist terminology, the paths of the Way. - The maximum number of electrons that can occupy a valence shell. 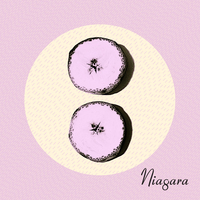 Niagara have also released a self-titled 4-track digital ep in February 2012.